Adopted from "All for Dogs Rescue" in Bend, OR in March 2010, Colby is believed to be 3 1/2 or 4 years now. He adapted to our family of five just perfectly. He is great with the little kids, and great with the cat. He loves to swim the river with me and go for hikes, walks and typical errands. 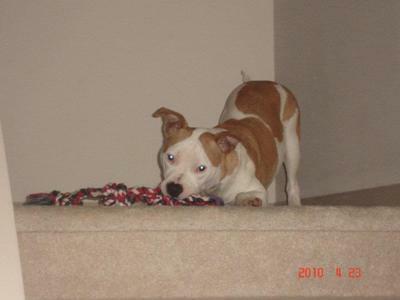 Colby is our first Staffordshire Bull Terrier/pitbull and we are sold on this breed. We are even considering adopting another companion of the same breed for him. These are the best dogs ever!! They are the best ever! Congrats on your new fur baby!! I'm sure he would love a fur brother or sister. How wonderful it is that two fantastic fur people will have forever homes because of you. Isn't it amazing what happens when people open their hearts and minds to these dogs? I love my pitty puppy and I can't wait to adopt her a fur sister! Pitty puppy kisses! I would recommend getting a female, preferably spayed, but you can do that too. I find my baby Bruno gets along better with female, no threat to him, but actually now she's the boss. Typical female. At first they had some little tiffs, we kept under control, keeping their food separate, but now after 3 years, they're great together and such good companions too.